Things are not going to plan. They never do really, do they? The plan, you see, was for this to be a tough, difficult, challenging expedition, where I’d ride for many days without seeing another person, let alone finding a warm bed and a hot dinner. I was looking forward to the suffering and the solitude, and the constant nervous edge of fear that I was taking on more than I can handle – or, worse still, that I could handle what I was taking on, but that it would nonetheless be more painful than I ever imagined I’d endure. I had never experienced cold below -30, and there was no way of preparing myself for that, beyond stocking up on warm clothes and hoping for the best. Venturing into the unknown is always the scariest part of any expedition, and I had no way of knowing how my body and mind would react to extreme cold. And, I realized, as I pedalled laboriously along the cycle path that follows the highway between Anchorage and Wasilla, where a friend-of-a-friend’s spare room was waiting for me, that I hadn’t anticipated just how slow a fatbike is, with its super-low gearing and its four-inch tyres that roar and rustle through the crispy snow, sounding almost as if the bike has an engine. I tend to average about 80 miles a day when I’m touring. Anchorage to Wasilla is about 45, and it took me from 7.30am, a couple of hours before dawn, till just before it got dark, at around 4pm. So the second half of the ride was filled with doleful mental calculations of distance and mileage, and slightly panicked reviewing of my schedule. I’d worked out a couple of months back that, in order to get to Seattle in time for my flight, I’d need to average 40 miles a day, and since I’m capable of riding much more than this, that I’d have a great deal of spare time for rest days and detours. Now it was looking as if I’d have to ride from dawn to dusk (and longer for the first few weeks), and take almost no rest days. For the whole week I’d stayed there, Anchorage had been muffled under a blanket of thick grey cloud. 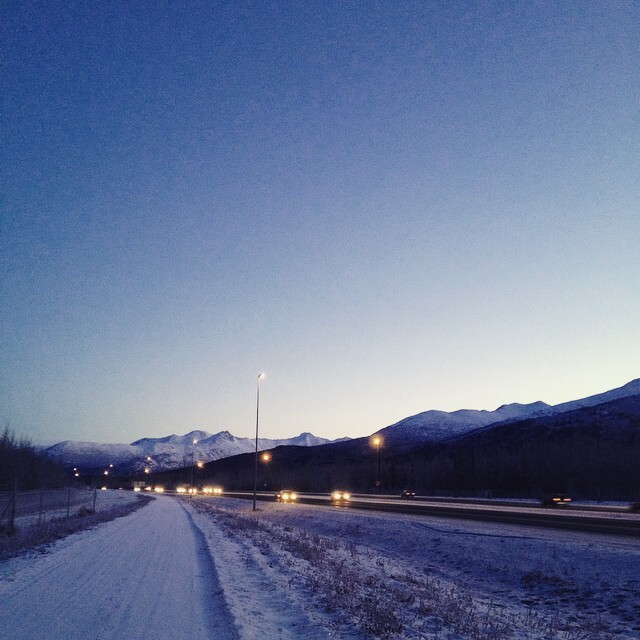 But when I got on the bike there were stars above me, and an hour or so into my journey I began to notice the looming black silhouettes of the Chugach mountains to my right, as a pale blue glow spread slowly up into the sky from behind them. The air was sharp and icy, and several degrees colder than it had been so far. The sun eventually climbed above the horizon, but stayed close to it, as if ready to duck away again at the first sign of trouble. In the distance, a long way ahead of me, an even higher line of mountaintops began to glow lilac and apricot, while down at road level I was still in the shade and, close as I was to the Chugach, looked like I might stay there for the duration of the ride. Halfway through the ride the valley opened out as it reached the confluence of the Matanuska and Knik rivers, and suddenly the road was clear of snow. I could immediately tell why. A brisk wind rushed straight down from the north, pushing me insistently back the way I’d come. And I realized the road wasn’t quite clear – it was coated with a thin sheen of ice. ‘Riding a heavily loaded fatbike into a headwind, on ice’, I thought to myself, not without some wry amusement. ‘If this continues, it might take me something more like six months to get to Seattle.’ As I left the bridge behind me I rode into a tiny patch of brightness – the only direct sunlight I’d see that day: the product of a slight elevation and a notch in the opposite mountain range. It lasted all of five minutes before the sun slipped back down behind the rocks, the temperature dropped a few degrees, and the light began to drain from the sky. 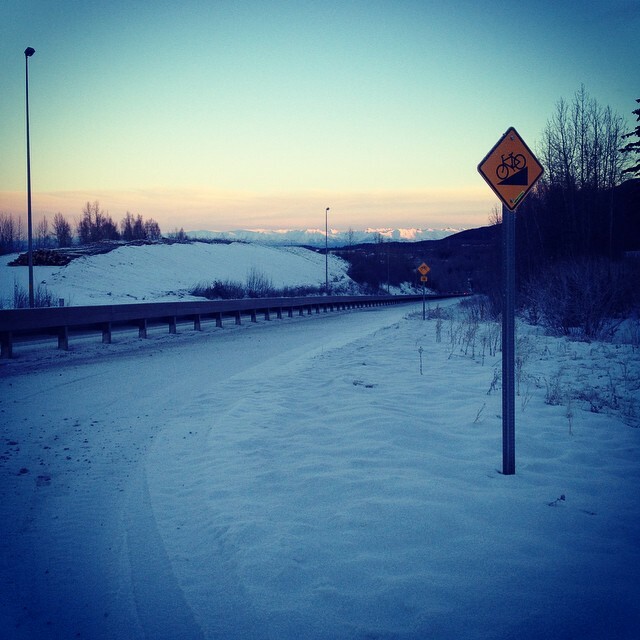 There was no relief when I reached the sprawling suburbs of Wasilla. In this part of the world, suburbs sprawl so capably that as you ride through them there’s very little to see, and you feel just as alone as if you were still out on the highway. Tom’s house was on a long leafy road that looked more like a country lane than a city street. Every now and then, as I struggled north on the ice, drawing closer and closer to the base of the tall snowy mountains that I’d been following all day, I’d pass a turning, numbered with some confusing logic in the high thousands. (Alaskan houses all have four-figure numbers, even on the shortest streets; I’ve yet to find out why.) Some of the turnings weren’t even numbered, and I worried that I might have to ride several laps of this long lonely road before I found my home for the night, when I was already limp with tiredness (and alarmed that I was feeling so wiped when it was only the first day of my trip). But to my great relief, Tom’s house was only halfway up, clearly numbered, and hidden away among the trees down a very short, snowy driveway. And there was Tom himself, standing in the brightly-lit kitchen window, waving with an excitement entirely disproportional to my arrival. Tom is a veteran of several long bike rides himself, so his welcome was note-perfect. 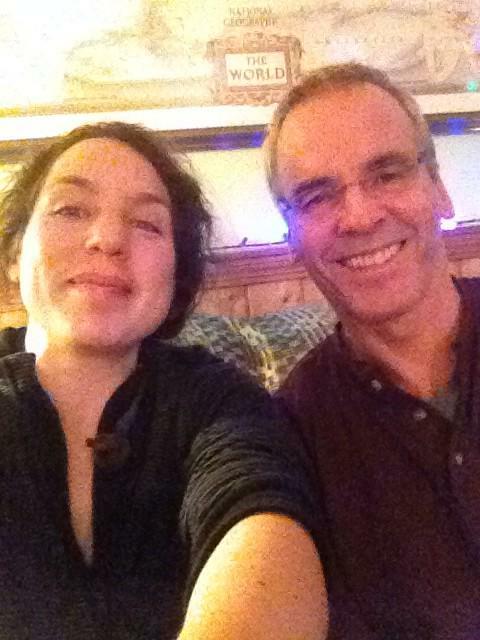 He gave me a huge hug, wheeled my heavy, dirty, snowy bike straight into his warm, bright living room (where it sat next to the dining table and made a muddy puddle on the floor, which he didn’t seem to care about), pointed me towards the shower, and handed me a pint of gin & tonic to take with me. When I emerged, glowing and grinning, we polished off plates of pasta, and stayed up far too late, energetically swapping stories about our bicycles and adventures, and experimenting with my panoply of stoves. The next day I lingered at Tom’s house while he went to work, waiting out my last day of period pains and anxiously unpacking and repacking my bike, very much aware that I was trying to assert some semblance of order, and therefore control, over the still frightening and chaotic prospect of my so-called expedition. 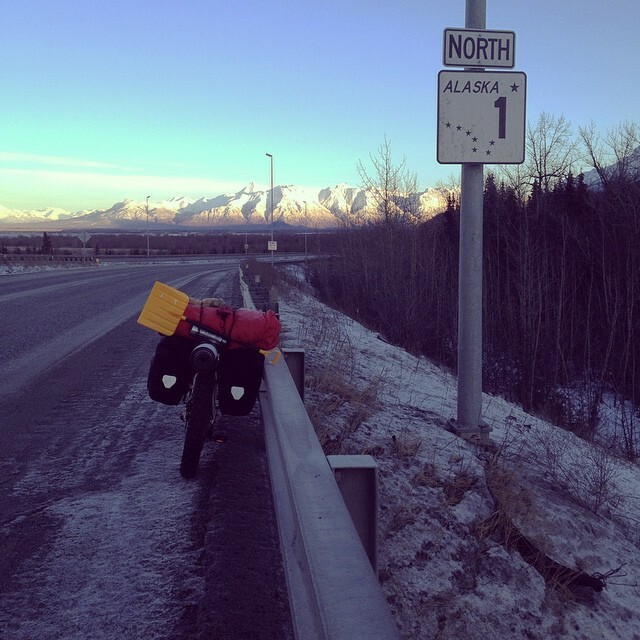 Tom works for the fire department in Anchorage, so his daily commute is exactly the length of my entire first day’s ride (though he tends to cover in 45 minutes what took me a whole day), which struck me as excessive before I realized that an hour’s drive is fairly modest by Alaskan standards. All day long he emailed me, encouraging me to empty his fridge into my self and panniers, suggesting various other ways I could ransack his cupboards and facilities, and offering ominous reports of how far the temperature was set to plummet over the next few days. He arrived home with a spare pair of liners for my boots, insisting that I’d need them, as it would be impossible to dry out my existing pair overnight at sub-zero temperatures. I had tried to convince him not to bother, but he was right, of course. And then we waved goodbye, both attempting to conceal our anxiety about my welfare over the next few days, and I pushed off (slowly, laboriously) along the Glen Highway, along the Matanuska Valley, away from all the comfort and friendship I’d found in Anchorage and its environs, my next hosts several hundred miles along a very cold road, in Tok.